Srishti Agarwal, a Silver Level Award participant from Billabong High International School, Bhopal completed her Adventurous Journey at Rishikesh. Here, Srishti is sharing her experience of interacting with nature. I was born in the urban jungle. A silent addition to our modernized civilization hurling through chaos and drowning in the hoots and honks of the 21st century. The cement, the concrete, the bricks, the skyscrapers taller than trees, the pollution encasing the stars and a patch of grass that we called ‘nature’. The city ran in my veins deeper than blood. But, years later when I turned 16, I was obliged to go to for my IAYP Adventurous Journey camp in Rishikesh and spend about a week there. It was actually a ‘back to nature’ initiative, which seems my worst nightmare, as I chose to describe it. Away from the city, completely detached from ‘life’ was not my idea of either a ‘frolic’ or a ‘serene’ outing. Yet, what has to be done, needs to be done. And so I left Bhopal for Hardwar, with a heavy heart and a weary sigh. The train journey was brimming with boredom but it was lesser of the two evils as the stay would surely be far more torturous. The morning that we, the seventy Award participants along with 5 mentors, reached Haridwar was by far the most uneventful day for the remaining time was spent in commuting to the camp site -- beside the Ganges and surrounded by thick forests. I truly felt ‘caged’, like a person left in isolation, who can shout all they want, but in the end, it’s like speaking to a void. But as nightfall approached, something changed. Sitting by the fire, reading a book, (yes, indeed!) Waiting for the cell phone reception, I noticed for the first time in the sky, a constellation, Aries. The stars, those plain asteroids, shone brighter than any light and the moon was stupendously beautiful, bathing our camp site in the light I can only describe as ethereal. Not a sound was heard, apart from the easy wind and the rustle of leaves. There in that moment, I felt the closest to peaceful. Perhaps, it was the state of my mind, drunk with fatigue as I was or there actually was a connect that I could feel to that evening sky and the never-ending forest. Solitude… the absolute solitude that I had feared all my life, now seemed comforting. As if I was a child, being cradled by a mother. In Urdu, they talk of a deep soul connection that cannot be explained called ‘Roohani’ and for the first time, I could understand what my grandfather had been referring to as I recalled our past conversations. I could understand why Robert Frost found pleasure in the ‘dark and deep woods’ and why Wordsworth was so enamoured by Mother Nature. All my time at Rishikesh -- everything and every day, passed like a whirlwind between adventure sports and team building activities. Rafting, rock climbing and even the nature treks were anything but generic. The thrill of braving through the roaring and rumbling Ganga in a measly raft and almost falling off on the raging rapids or descending down an almost vertical rock at a 90-degree angle changed my perspective towards life. Fragile and transient as it is, The forest walks were long, running over steep hills and ramshackle grounds; they left us gasping for air and thirsty as the Sahara, yet the picturesque landscapes and the sheer beauty of the morning sun were enough balms for all our wounds and bruises. Admittedly, the Flying Fox and Valley Crossing were my favourites. 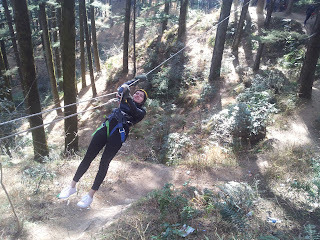 Hanging by a wire, cutting through the air at top speed and traversing between two hills while dangling in mid-air were as exhilarating and liberating as can be. However, it was my late night rendezvous with myself that somehow made me feel ‘infinite.’ Even the Ganga seemed to hold more meaning to me and in its swiftly flowing waters, I could see clearly a reflection of my own life, passing me by. Those waters, sprinkled in every Hindu household on an auspicious/ joyous occasion are also the final resting places of a human being’s ashes. Only now could I fully comprehend the majesty and sanctity of that river.